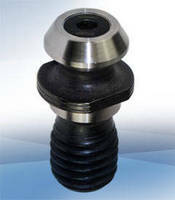 Compatible with Mazak data control and tracking systems, RFID Tool ID Tags mount in end of tool holder retention knob, which is then screwed into top of tool holder to provide handling point for automatic tool changing and repeatable place for reading Tool ID tag in Mazak machining centers. Designed to withstand elevated pressures and centrifugal forces, tags have center hole that is compatible with cooling and sealing apparatus, which allows cooling fluid to pass through tag and retention knob. Florence, KY: Being able to track and automatically identify tools being loaded in Mazak machining centers is a reliable and cost effective way to prevent manual data entry errors and accelerate the operational time of a machining processes. Balluff, a world leader in RFID based Tool ID solutions, has created RFID based Tool ID tags compatible with the existing Mazak data control and tracking systems. These new RFID tags are designed to be mounted in the end of a tool holder retention knob. This retention knob is then screwed into the top of the tool holder to provide not only a handling point for automatic tool changing, but also a reliable and repeatable place for reading a Tool ID tag in existing Mazak machining centers. These tags include a center hole compatible with the cooling and sealing apparatus that allow cooling fluid to pass through the center of the tag and retention knob used by Mazak machines. These tags are designed to withstand the elevated pressures and centrifugal forces present in this mounting position. These new Mazak tags are also designed to be 100% compatible with the existing Mazak tag reading protocols and database systems and require no change in programming. These new tags can even be interchanged with existing Mazak CAT 40 and Cat 50 tool holder retention knobs and tags. The new processor and reader head that is also available can be used with either the Mazak protocol or provided with the standard Balluff protocol for greater flexibility and reliability in interfacing. Balluff Inc., the U.S. subsidiary of Balluff GmbH, Neuhausen, Germany, is a leading manufacturer of a wide range of inductive, optical, capacitive and magnetic sensors as well as linear position transducers and ID systems. Balluff products for OEM and factory floor solutions are used to control, regulate, automate, assemble, position, and monitor manufacturing, assembly, and packaging sequences for industries including metalworking, automotive, plastics, material handling, wood processing, aerospace, electrical, and electronics.